Carl-Gustaf Svingel’s 1940’s is like gluing an Etruscan vase.Fragment of memory images, a number of press clips. But they lack shards, which maybe not even his closest knew. In early September 1939 Germany plunged Poland followed by a declaration of war from Britain and France. The Soviet Union penetrates Poland simultaneously and World War II is a fact. 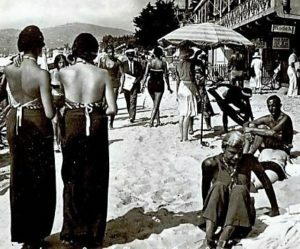 Why do not we know Carl-Gustaf Svingel in Juan-les-Pins on the Riviera? Was he traveling from Italy where he studied music for two years? Or did he join Gustaf V’s entourage when Mister G played tennis in Nice in the spring? The bustle of Avenue de Suède, a half-hour trip from Juan-les-Pins, gives tourists a reminder. 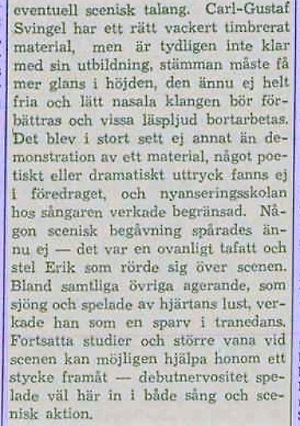 With Carl-Gustaf’s musicality, language learning was not a problem, even though teaching at Hjärtum city school was only the training of tailors at Vanföreanstalten in Gothenburg. Even though he had advice, there was probably a dyslexia that prevented further studies. For the intelligence, nothing was wrong. 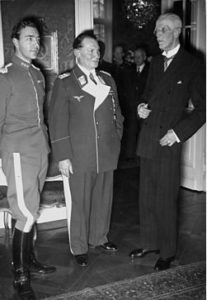 On the downturn in February, the king of Berlin met Hermann Göring, then in the Nazis’ zenith as Hitler’s deputy and manager of Gestapo. In company, the governor had the grandson, Prince Gustaf Adolf, who was there to compete in horseback riding. The Prince Gustaf Adolf (the father of the present King) and Sigvard entered or were included in Svingels’ acquaintance circle, because, according to him, they rode together at Djurgården. Carl-Gustav, who changed the name of Samuelsson to Svingel last year, managed to get home to Sweden because the German West Front was still a leap of war. 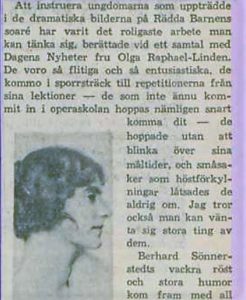 In December 1940, Svingel appeared in DN’s slots as the recorder in the Svinaherden theater and Ingalill in Rädda barnens Autumn Soar. Bernhard Sönnerstedt, later Operachef, had the lead in this show. Svingel did not succeed in attending the Musical Academy but paid the lessons himself – during the war at the Finnish- born baron Illmari von Delwig in Stockholm. How Svingel could afford is a riddle for compensation from temporary involvement can not be enough. Not even the extra knuckle in an exclusive men’s dressing – but discounts for a singer as far as the clothing is supposed to be. He sings songs by Geijer and Topelius in Vasapark’s open air concerts. Attends the French Church Passion Worship and other church activities. The best birthplace was performances at funerals and weddings. 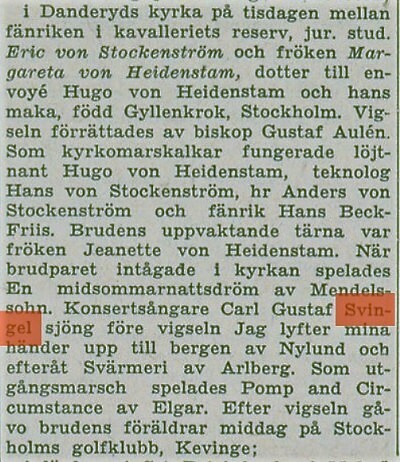 In the summer of 1945, the concert singer Svingel in Danderyd’s church sings when the fist Eric von Stockenström marries the same noble Margareta von Heidenstam. Tärna is the bride’s 20-year-old sister Jeanette, who in the spring of 1944 sacked Raoul Wallenberg’s friery – before he left for the romance to Budapest. Wallenberg has disappeared since January. Nobody knows that he is gnawed in a cell in the Moscow prison Lubjanka. In the pocket diary that Soviet returned to the family in 1989, Passion Jeanette, noticed that the couple was at the cinema, saw Viveca Lindfors in Passion. Thanks to the involvement, Svingel fought with ”Stockholm that seemed”. The claim that he knew Raoul Wallenberg and Dag Hammarskjöld need therefore not be empty. 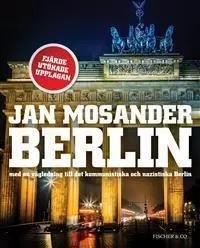 Jan Mosanders quotes in the book Berlin Gunnar Lagergren , married to Raoul’s half-sister, according to Svingel’s birth. Lagergren was a riksmarskalk at the court so he should know: ”We have heard in all the family that Gustaf V would be Swing’s father. I do not know what to believe myself. But there are people in the Wallenberg Association who believe that it is true and not the slightest doubt ” . They must be anything but the commentary, but the comment suggests that Svingel was a name at the court and family Wallenberg at an early age. 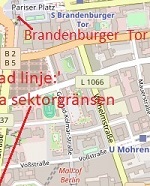 Was Svingel already familiar with Willy Brandt who during the war with the family lived in Hammarby Heights? 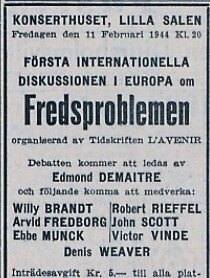 In any case, through acquaintances known to the journalist Brandt, participated in many events to bring to square’s books about the occupation of Norway. In addition, Brandt played back football for Hammarby. The fact that Svingel was lied with the Norwegian home front – because he had relatives in Norway – could not be confirmed. From Svingel’s apartment at Gärdet it was not far to Övre Östermalm, whose Stockholm he attributed, as noble as in the elderly at the Royal Palace. The childhood children who became aristocrat quickly developed a social talent for living in better salons. In March 1946 it was time again. The diplomat daughter Jeanette von Heidenstam was married with a Wilhelm Tham. The same idle noble nobility. Same Svingel. Also Jeanette von Heidenstam . could move. For her she became a TV hallo-hostess and then representative programmable, in the Melodifestival , among other things. In order to attract a wider audience, the Royal Opera used to play the host memories. Prior to the premiere in the summer of 1946, Arne Ohlson received diphtheria and Carl-Gustaf got the chance to get into the role of Erik. 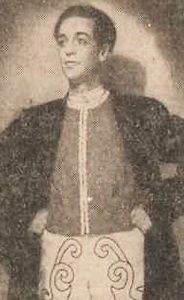 The outcry was no worse than (with Arne Ohlson , from Uddevalla not far from Svingel’s hometown otherwise) played Erik in fifteen performances of the Värmlänningarna until 1951. From now on, Svingel titled opera singers, like when he performed at hometown festivals and weddings . 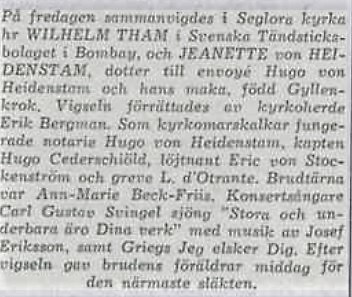 In the summer of 1950, Svingel played a beautifull major type 91an Karlsson in the operetta Lilla Helgonet . It was at the Narva Theater, later known as the Allé Theater on Narvavägen. Lilla Helgonet has been the side of the Paris premiere, a trusted audience and Stockholm’s private theater. Swedish Elna Gistedt was a primedonna at Ernst Rolf and in operetta around Northern Europe. In 1922 she played Lilla Helgonet in Warsaw – and stayed for 22 years. Her restaurant ”With Mrs. Elna” in Polish capital became a waterhole for Poles and Swedes during World War II. Even for resistance men in 1942 at Mrs. Elna, to Ace Director Sven Norrman, 2,000 film copies revealed the Holocaust. Norrman took the portfolio to Stockholm for further promotion. to London – where the BBC is rapidly spreading the news of the massacre. Gestapo seizes six Swedish directors and judges four to death. Before being pardoned, they get food from Gistedt’s restaurant thanks to muted guards. She herself succeeds in hiding from detention and flying home to Sweden. The traffic to Scotland was a nail in the eyes of the Germans. In August 1943 they shot ABA’s Gladan above Skagerak. In October, also the company’s second DC3, Gripen, which plunged on Hållö outside Smögen. 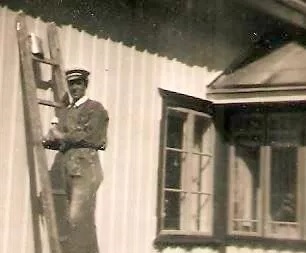 A year later, kyrkoherde Erik Perwe dies with forged ID documents when the Lufthansa plane disappears outside Falsterbo. The perpetrator of the Germans speculates – perhaps Perwes knowledge of the Holocaust because he hid Jews in the Victoria Assembly’s house. Svingel moved like a fish in the water between the castle and the hut. Socially and responsibly as he was, he probably hugged both popular moods and what was said between bowl and wall. Stockholm was with all the spies of the north Casablanca to tie in with Ingrid Bergman. With a time shift, Gistedts and Swings live around each other. In 1948, Gistedt gave cigarettes to Swedish prisoners in a Polish prison. Much speaks of the fact that there were sailors from the missing engine guns Ivan, Sture and Kinnekulle. The captain of Kinnekulle was Bertil Johansson, three years apart from the same town in Hjärtum as Svingel. The exploration of the sailors was conducted by the Consul General of East Lundborg in Berlin – which Svingel cooperated with in the early 1960s. In 1964, a police report from Gistedt’s testimony was written , equally neglected by the Swedish Foreign Ministry, as Swingel’s invitation to exchange by Raoul Wallenberg two years later. The east contacts were one for hot potatoes. 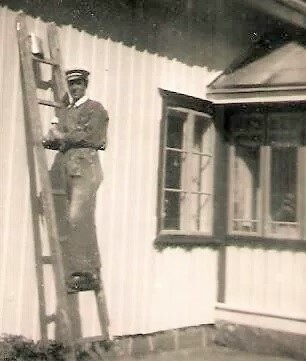 The Communist regime forced Gistedt to Sweden, where she devoted herself to refugees at the Inner Mission Mission Guest House Vrigstad in Småland. In 1953, Svingel was volunteer in the same guesthouse, which served as a sanctuary for Polish women from concentration camps. 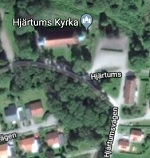 Svingel often returned to Hjärtum to see his mother’s grave and greet his friend Jenny Andersson, who until retirement was the leader of the retirement home. Svingel used to work in the church during the 40’s and from the 50’s. Unlike the high fairs, it was then packed. ”Svingel liked to make a jump so we were terribly fun,” Karlsson explains. We lasted for fourteen days for a job that a painter would certainly have done on one. 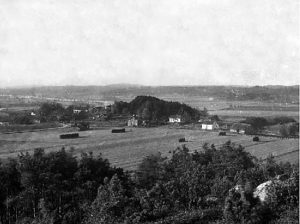 In that connection, the Swedish Church started international aid work in Luther Help, which later became the engine of Svingel’s humanitarian operations.